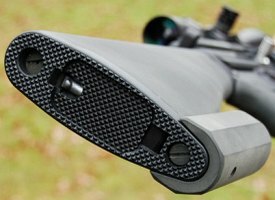 Some months ago, AccurateShooter.com and Robert Whitley teamed up to build a new 20-caliber AR15-based rifle. Our project goal was to create the “ultimate” semi-automatic prairie dog rifle. 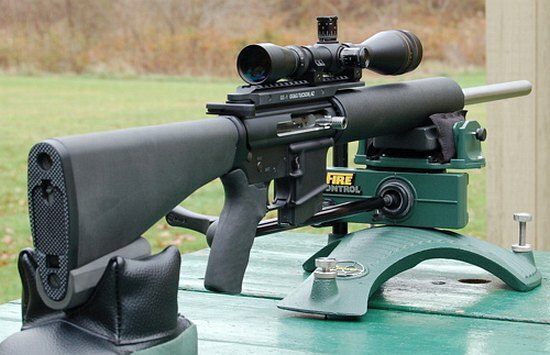 We wanted a low-recoiling, flat-shooting AR that worked great with a front rest and rear sandbag on a transportable field bench (such as the Coyote Jakes bench). We knew the basic AR15 design needed some “upgrades”, so Robert developed Delrin bag-riders for the forearm and buttstock. But we wanted the bag-riding components to be removable so the gun could be easily returned to standard configuration for shooting with sling or bipod. Robert worked with EGW to develop machined Delrin bag-riding units front and rear. The 3″-wide front “sled” attaches to the threaded anchor for the sling swivel stud, while the rear bag-rider mounts in place of the standard rear sling loop. Our Ultimate Prairie Dog Rifle (PDR) features a 24″ Bartlein 11-twist cut-rifled barrel, DPMS side-charging upper, and a Jewell trigger. It is chambered in “20 Practical”, a cartridge popularized by Warren “Fireball” Brookman. This is simply the .223 Remington necked down to .204. You can use your existing .223 brass — no special case-forming required! 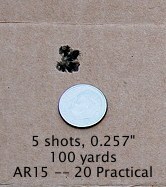 The 20 Practical is accurate, flat-shooting, and has almost no recoil. The advantage over the standard .223 Remington is that, grain for grain, the bullets have a higher BC and travel at a higher velocity for more dramatic effect on a small varmint. The ultra-low recoil allows you to easily see your hits, even without a muzzle brake. The 20 Practical, launching 40-grainers at about 3750 fps, shoots flatter than a .223 Rem with 55gr hollowpoints. Robert has lots of experience building AR15 uppers and he has developed advanced features that make the gun much more ergonomic and easier to shoot from a prone position or from the bench. First, Robert offers a side charging handle. This lets you keep your head in shooting position while charging the gun or retracting the bolt. Second, he has fitted a GG&G extended scope rail. This permits the scope to be mounted far enough forward to allow proper eye relief while using a high-magnification scope. 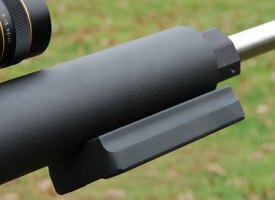 Without an extended scope rail you typically have to move way back on the gun to get enough eye relief and then you can’t seat the buttpad properly on your shoulder. 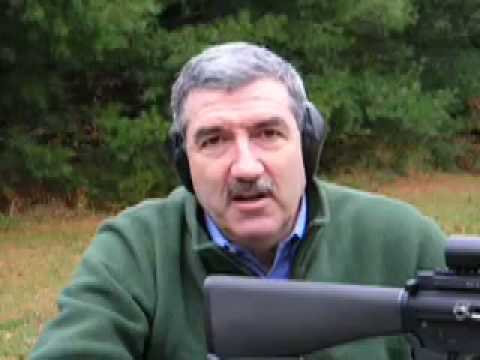 In the video above, Robert shoots the Ultimate PDR with Berger 40gr BTHP bullets. Robert is using the Caldwell Fire Control front rest and rear sandbag. The Fire Control Rest is an affordable, joystick-style mechanical rest that allows you to easily adjust windage and elevation with a single movement of the joystick. The rest is solid and sturdy; Robert says it worked well. In this session, Robert shot three five-shot groups. Each group could be covered by a dime, which measures 0.705″ in diameter. Subtract the 0.204″ bullet diameter, and you can see this rifle easily shoots under half-MOA, even rapid fire (groups 1 & 2). For the third (and last group), Robert slowed down the pace, aimed more precisely, and put five shots in 0.257″. Not bad for shooting off a wooden bench without wind flags! Like what you see? As soon as accuracy testing is complete, this rifle will be auctioned off to benefit this website. EGW will be offering the front and rear Delrin bag-riders. They will cost $40 each or both front and rear for $75.00 total. Robert will also be offering 20 Practical uppers for your AR15. Email rcw3 [at] erols.com or visit 6mmAR.com for upper specs, options, and prices. Share the post "Whitley builds Ultimate AR Prairie Dog Rifle"